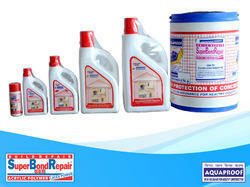 Our product range includes a wide range of aqua bond repair, super bond repair, sfmc, rust kleen, aqua insta plug plugging mortar and krack fill. 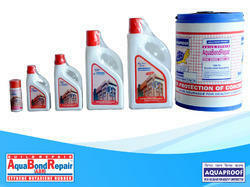 Aqua Bond Repair is Styrene Butadiene Rubber based milky whitematerial. It is a multi-functional material. ABR is all kinds of cement concrete made with ABR has excellent compressive and tensile strength. ABR modified cement plaster has smooth and concrete are having excellent bonding and waterproofing properties. ABR modified cement slurry is having excellent adhesion and thus it joins new construction to old construction. ABR imparts flexibility to cement and thus plasters made out of ABR are crack free. ABR reduces the water demand of cement. Concrete made with ABR is having excellent Compressive and Tensile strength. ABR modified cement concrete is denser and water tight. ABR is non-flammable and non-toxic and thus it is eco friendly. ABR modified mortar is having excellent chemical resistance. ABR modified mortar is having excellent wear and tears resistance. Super Bond Repair (SBR) is white liquid Acrylic Polymer admixture for waterproof coating, bonding agent, repair-mass-in-fill and non-shrink polymer cement grout system. It is a multipurpose bonding agent. Microsoft Super Fine Micro Concrete (SFMC) is a cement based high strength, fast-setting repair mortar for repairing damaged columns, beams and structure. SFMC is self leveled hence easy to use and economical. 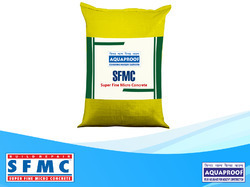 SFMC is cement based hence it has excellent bonding. SFMC requires only on site addition. It is cement-based so it is eco-friendly. It is a do-it-yourslef product. It does not require skilled labour. It achieves an excellent bond with present concrete. It attains strength very quickly. It has excellent tensile and flexural strength. Rust Kleen water based rust release agent suitable for pretreatment of metal iron before applying any coating. On application of Rust Kleen rusted surface gets clean easily and safely. 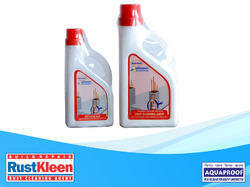 Rust Kleen can be applied by brush or cotton cloth. 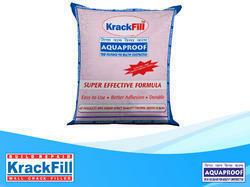 Krack Fill is a white cement-based single component powder material, which is useful to fill exterior & interior cracks. It requires only on-site addition of water prior to use. The special chemicals present in it have excellent bonding properties. 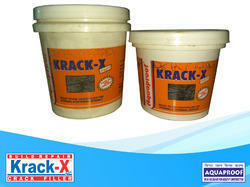 Krack Fill dose not content any hazardous chemicals and is ideal, also for potable water tank works. It is very good material for outside/inside cracks of 4/5 mm width. It is cement-based material and thus it bonds very well with all kinds of cement civil works. It is a “DO IT YOURSELF” products. It dose not required skilled labour. It has 2 hours of pot life, so the job can be completed comfortably with ease. It dose not required water curing. It dose not get affected by UV rays. It is not affected by carbonated attacks. Krack-X Shrinkfree is composed of best quality polymer, properly selected fillers & additives. It is fast drying flexible, very light weight, soft putty like material used for filling cracks in plastered surfaces because it is 100% shrink free, water resistant after drying & bonds strongly to cementitious substrates. Shrinkage-Non-shrink even after curing, prevents from cohesive & adhesive failure on exposure. User friendly-One pack, very soft paste, easily applicable by fingers or putty knife. Application-Applied as one time filling (does not require second time application, as required in other acrylic sealants. Staining- Does not migrate any liquid component into concrete surface thus prevents staining. Adhesion-Excellent adhesion to cementitious surface prevents water leakages through the cracks. Sagging-Non-sag nature helps in filling of vertical & overhead cracks. Saving-Saves time, labour & energy. Paintability-UV & weather resistance properties increases the life expectancy of the surface. Aqua Insta Plug is a cementatious dry powder with special selected additives with exceptionally good fast setting and strength developing characterics. It needs only addition of water to produce ultra rapid set plugging mortar. Easy to use. Needs only addition of particular amount of water has to be added and mixed according to its application. Fast setting. This product set fast to give immediate relief from leaks. Durable. Low porosity of the patch insures performance of the repair extra strong. It forms a dense hard durable mass upon setting. Chloride free. The product is free from chloride, sulphates and nitrates hence no risk to RCC. Compatibility. Being cementetious it is compatible for use in all concrete structures, stones, clay, bricks, etc., it shows least shrinkage. Stable. Similar thermal capability as concrete. Looking for Build Repair ?